How can you make the most of the storage in your motorhome? Here are a few ideas, backed up by sound advice. One of the biggest considerations of any motorhome is arguably one of the least talked about. Storage. Just where do you put everything you want to take away with you, without encroaching too much on living space, endangering your passengers, affecting general handling or exceeding payload allowances? True, most motorhomes cope admirably with such demands, but there’s often that time you want just a bit more luggage space. Short of adding a trailer, there are alternatives – from extra boxes, to simply making more of the original storage spaces on-board. Just be wary of DIY – your own or others! Anything that might involve changes to the bodywork, for example adding an external hatch, might affect a vehicle’s warranty and/or structural integrity. Similarly, with any bodywork, metal or GRP, there’s the consideration of adding reinforcement around any hole you’ve cut. Also, before you rush out and invest in potential expensive fittings, it’s worth making sure simple, cost-effective changes can’t be made to your existing storage options. Make sure you’re happy with your payload. There’s no point in adding extra storage if you’re going to exceed your motorhome’s MTPLM (Maximum Technically Permitted Mass, also referred to as gross vehicle weight). Be aware, also, of the maximum weights allowed on each axle (especially at the back). Remember, your motorhome insurance could be void in the event of a claim if you exceed such limits and it can be proven excess weight was the cause of an accident. To make sure all is as it should be, consider taking your vehicle to your local weighbridge. It doesn’t matter if it’s loaded or not, what you will get is an instant reckoner as to its load capacities. If you’re thinking of adding a roof box, consider how you’re going to access it. On taller vehicles, you might have to use a ladder. One alternative is to find a storage box you can add to an existing cycle rack, although use of such an item might preclude carrying bikes, of course. 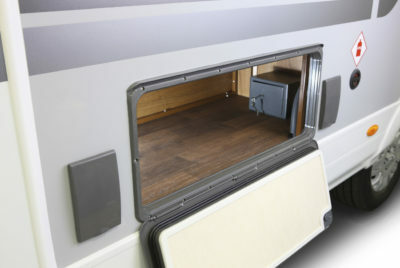 Plenty of motorhome workshops are in a position to source something like this extra exterior-access storage door that can be adapted to fit the majority of coachbuilt motorhomes. Its final location will depend on the interior layout, as it’s designed to open onto an existing underseat area. This particular example was spotted at the Auto-Sleeper Service Centre in Worcestershire, where a team of highly skilled and experienced technicians says it has added such fittings for plenty of other makes. 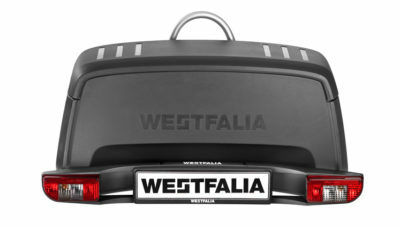 This is designed to fit onto Westfalia’s BC 60 towball-mounted cycle rack, so it’s not a one-off buy. Just bear in mind, although the box, which weighs 15kg, has a 45kg payload and a 200-litre capacity, you’re adding a load to the furthest point beyond the rear axle. Off its fitting, there are wheels for easier transporting. It has a locking lid and also locks directly to the rack. It’s particularly suited to the kind of kit you might not want in the habitation area of your vehicle, e.g. muddy gear, fishing tackle etc. Although designed primarily for use on cars, certain types of motorhome will happily take a roofbox (indeed, Omnistor, which makes such boxes, is now part of the Thule empire) – especially if your vehicle already has roofbars. Fully weatherproof, a box like this can be removed when not needed. A mid-range model in the Touring line-up, the 600 has a 300-litre volume and a load capacity of 50kg. It weighs 12kg and measures 193cm x 67cm x 44cm high. 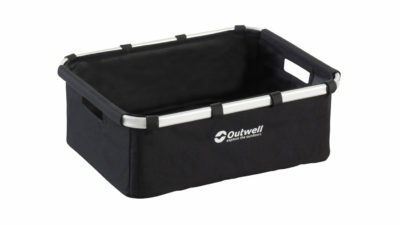 From leading family tent company Outwell, these are just a small selection of the storage bags, baskets, holders and more that you could use to make the most of any places on board where a bit of extra organisation can be a boon. Or simply where you don’t want too many things sliding about and/or to reduce rattles. This series is in black, but there are plenty of others in all manner of colours, including stripes. All pack down virtually flat when not needed. These come in four sizes. The largest, the XL, is big enough to use as a laundry basket, while the S is small enough for cutlery and any other small odds and ends. Something like this can help optimise the space in a wardrobe, or a motorhome garage zone. It’s especially good for the latter, where you might want to keep smaller items together without the risk of losing them. Fixing is via eyelets or you can simply use a coat hanger. 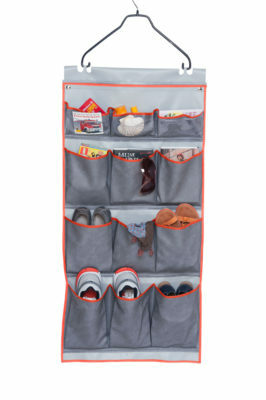 Also from the Hindermann range is the Espace, a shoe holder in a similar style. Got any advice or suggestions on how to maximise storage in your motorhome? Feel free to add your comments below. I have found old shoe boxes to be very useful. Because I mostly wild-camp I usually take enough clothing to cover the whole holiday period, invariably four weeks, but by careful folding I find that four weeks’ requirements of shirts, underwear and socks can be condensed down to a few boxes which then go in an under-seat locker: in themselves, these take up less volume than folding plastic boxes. I cut down plastic milk crates to fit in the bottom of the kitchen storage cupboards: these are a tight fit, effectively only removable at the end of a trip, but they enable secure, rattle free stowing of all sorts of bottle and cans. Even so, these cupboards are voluminous and there is much wasted space above these crates so I have added slide-out drawers above them. Our Swift “Escape 624” has deep overhead lockers without shelves so much space is wasted: I have fitted fixed shelves but will shortly make these adjustable in a couple of the cupboards. I use shoe box lids to store small items and have three-four of these stacked in one of the overhead cupboards which I can slide out one at a time as required, just like drawers. The overall effect of storing everything so compactly is that I have space to spare! Hmm… we find that the best way to make the most of storage space in our Wellhouse i800 is to take less stuff with us!